Starting from Apr 13th 2018, DP450 Series will be discontinued. As a upgrade substitute, please check out the DPPT Series or DP20 Series Panel Meter for details. The new DP450 Series digital panel meters are suitable for a wide range of display applications. Designed as low cost solution, they offer ruggedness, reliability with 3 1/2 digit resolution for many current, voltage, frequency and process applications. Supplied in a standard 1/8 DIN package, a full range of inputs can be measured simply by selecting the proper externally accessible terminals located at the rear of the unit. The resolution can be changed by moving the jumpers behind the detachable face plate. Bright red .56 inch high LED characters are easy to read. Standard instrument power is 115 Vac. Optional 220 Vac is available. Dual alarm relays can be configured as one high and low. Engineering unit labels are supplied to indicate measured value. This series consists of seven models. They are DC Voltage, AC Voltage, DC Current, HIGH-AC Current, HIGH-DC Current, Scalable Process and Frequency. The DP450-HDCC model can be used with 60 mV, 100 mV or 150 mV shunts. 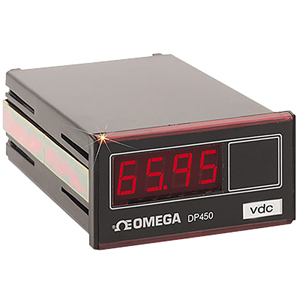 The DP450-HACC can be used with one or five Amp current transformers such as the CT Series.